Arno Babajanian (Armenian: Առնո Բաբաջանյան; Russian: Арно Арутюнович Бабаджанян; January 22, 1921 - November 11, 1983) was a Soviet Armenian composer and pianist, People's Artist of the Armenian SSR (1956) and Soviet Union (1971). He was awarded the State Prizes of USSR (1951, 1953) and Armenian SSR (1967, 1983). Babajanian (Babadjanian) was born in Yerevan, the capital of Armenia. By age 5, his extraordinary musical talent was clearly apparent, and the composer Aram Khachaturian suggested that the boy be given proper music training. Two years later, in 1928 at the age of 7, Babajanian entered the Yerevan State Musical Conservatory. In 1938, he continued his studies in Moscow with Vissarion Shebalin. He later returned to Yerevan, where from 1950-1956 he taught at the conservatory. It was during this period (1952) that he wrote the Piano Trio in f# sharp minor. It received immediate acclaim and was regarded as a masterpiece from the time of its premiere. Subsequently, he undertook concert tours throughout the Soviet Union and Europe. In 1971, he was named a People’s Artist of the Soviet Union. 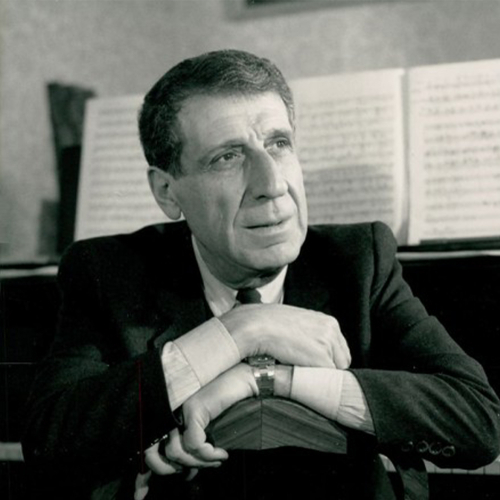 As a composer, Babajanian was active in most genres and even wrote many popular songs in collaboration with the leading poets such as Yevgeny Yevtushenko and Robert Rozhdestvensky among others. Much of Babajanian’s music is rooted in Armenian folk music and folklore. But generally, the way in which he uses uses Armenian folk music is in the virtuosic style of Rachmaninov and Khachaturian. His later works were influenced by Prokofiev and Bartók.